Experience Paris by night and see Paris in a whole new light. This tour includes a visit to the Eiffel Tower, where you'll get to skip the long lines to get in followed by a scenic cruise on the Seine where you can spot all of the major sights. The first part of this sightseeing tour starts by visiting the 2nd floor of the Eiffel Tower, probably the most famous building in Paris offering breathtaking views of Paris. Next your guide will take you on the second part of this tour - A beautiful boat cruise down the Seine, where you will see many of Paris' monuments illuminated along the way. The tour ends with a bus tour through Paris, which gives you the opportunity to discover Paris, its history, its tree-lined boulevards with their bustling cafes, monuments and plazas, such as Concorde and Vendome Squares, and the opera houses, Madeleine Church, rue Royale, Champs-Elysees, Arch of Triumph, Trocadero, Invalides, Notre-Dame and Chatelet Square. During the tour you'll learn all about of this beautiful city with your free audio guide (available in French, English, Spanish, German, Italian, Portuguese, Dutch, Korean, Russian, Greek, Japanese or Chinese-Mandarin).If you like the sound of this tour you might also like our Evening Tour Paris & Cruise combination. Shortly after your booking is complete your e-ticket will be sent directly to your email address entered at the time of booking, just print it out and bring it with you on your tour. The tour starts at the PARISCityVISION's office. Please plan on arriving 15-20 minutes before the tour begins. The tour runs 4 hours. Yes, child rates are available for children between ages 3-11. Children from age 0-2 are free when accompanied by a paying adult. That is so fantastic. Dear Viator already second year I am working with you and I am so happy and want to say a big thank you to you. "I love Viator and every my travel will be with Viator. Thanks a lot." 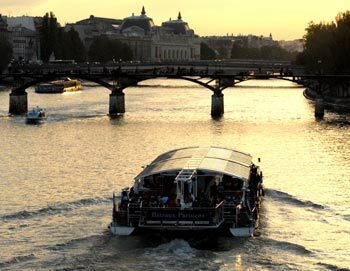 "I booked the evening Eiffel Tower and Seine tour online before arriving in Paris. The site was extremely user friendly. The tour itself was wonderful and reasonably priced. My husband and I arrived at the designated meeting place. Checked in, and then boarded a comfortable bus. Our tour started with a scenic cruise on the River Seine, where points of interest were pointed out. We then boarded the bus again and took a bus ride around Paris, which was very helpful in acclimating us to the area. Just before dark, we entered the Eiffel Tower and rode up to level two. It was very enjoyable to see Paris lit up at night. The tour was very organized, the staff was pleasant as well as helpful. I highly recommend this tour!" Your Paris office staff and guide Anna were fantastic! "We were given the wrong information by our hotel on the location of the meeting place for your tour. We were at the Eiffle tower waiting. On realizing our error I called your office number and was advised to meet Anna, our guide, at the cruise dock. She was standing apart from the crowd waiting for us with our tickets. It was wonderful to have such great service! Apart from the tour being rushed - seeing so much in such little time, which was our fault as we had such little time in Paris, it was wonderful!"